Tod’s Couture ‘made to order’ bedazzling loafers..
Tod’s, the Italian luxury leather goods company decided over a year ago to introduce a couture range inspired by its iconic D-bag Collection. This bespoke collection of handbags was a serious money-maker for the brand drawing celebrity fans such as, Nicole Kidman and Catherine, Duchess of Cambridge. Don’t worry if you missed out, this season the bespoke line of bags are back, and made in the same luxurious calf skin materials they have added a line of loafers. This season the loafer collection comes with a theme, Rock Princess, they are hand-embroidered with crystals in a choice of six shapes, the shoes can be customised by colour of your choice. The loafers are “Made In Italy” by an expert artisans, and are becoming one of the widely admired items of the company. 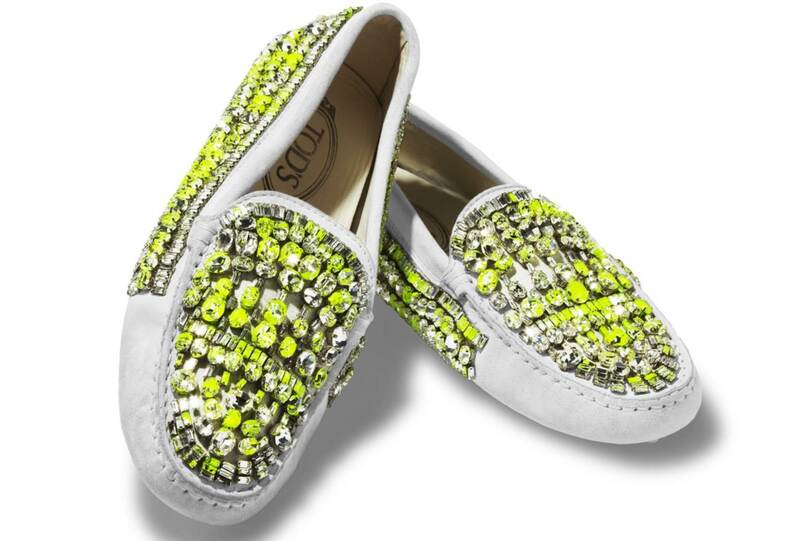 These bedazzling Tod’s couture loafers are available to buy via special order only. To order these you need to call Tod’s Italian office directly.